use of appropriate technology to develop a practical, economically, and environmentally viable management system. All of these factors are closely interrelated and should be considered from a total systems approach. For more information on developing a grazing system on your farm, see these eOrganic articles: Introduction to Grazing Management, Developing a Grazing System, and Establishing a Productive Pasture on Organic Dairy Farms. Most of the growth in grasses is fueled by carbohydrates produced by photosynthesis in the leaves. Based on New Zealand research, Figure 1 shows how pastures in phase 1 (about 1½ inch high or 450 pounds of dry matter per acre) grow very slowly because they lack leaf area for photosynthesis. They must draw nutrients from stores in the crown and roots until there is enough leaf area for the manufacture of nutrients. Repeated grazing during this phase depletes root reserves, reducing vigor and long-term productivity of the stand. Essentially, the plant never has enough time to fully recover from the previous grazing. Figure 1: Typical pasture growth. Adapted from: Milligan, 1983. In phase 2 (3–8 inches, 900–2,400 lb dry matter per acre), the plants make the most rapid and efficient growth. Their leaf area is great enough to use more of the sunlight falling on the area. Pasture nutrient content and quality is also highest during this phase. 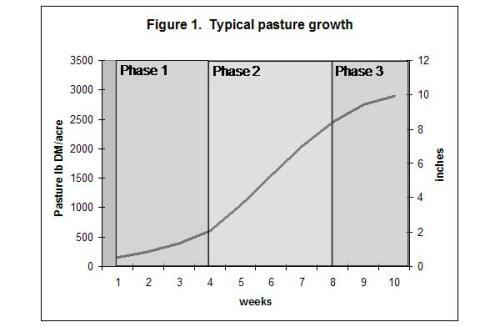 If pasture plants are allowed to reach this phase after each grazing, pasture longevity and productivity will be optimum. The time for plants to reach this phase after each grazing will vary depending on moisture, temperature, and plant species. Pasture growth slows during phase 3 (8–12 inches high) as lower leaves become shaded and die. Plants begin to send up stems to support seed heads. In this phase, nutrient content and digestibility decrease even though yield increases. Grazing during this phase often results in a good deal of wasted forage. The two most common types of plants in pastures are grasses and clovers. Clover and grass pastures grow most efficiently if you hold them at a 3–8 inches in height. Allowing dry matter per acre to exceed 3,500 lb before grazing, or grazing below 1,200 lb of dry matter per acre, will seriously reduce the pasture regrowth and, thus, the efficiency of pasture production. This pattern of growth will be influenced by soil temperature, soil moisture, soil fertility, and day length. Milligan, K. G. 1983. Controlled grazing systems. Aglink FPP 681, New Zealand Ministry of Agriculture and Fisheries, Wellington. Blanchet, K., H. Moeching, and J. Dejong-Hughes. 2003. Grazing systems planning guide [Online]. University of Minnesota Extension. BU-07606. Available at: http://www.extension.umn.edu/agriculture/beef/components/docs/grazing_systems_planning_guide1.pdf (verified 12 Mar 2014).